I’ve been dabbling with openCV over the course of my semester break in the winter, and even more now. It’s fun. Especially if you want some quick function jukebox for image manipulation. I learned git too, and also learned that the port for git is blocked in my campus. So, without further ado, I present facestalker, a loosely built program that uses certain well-established algorithms for recognizing frontal, criminal-pose faces ( aaahhhh – did I mention that I’m exposing a top-secret government project ? ). 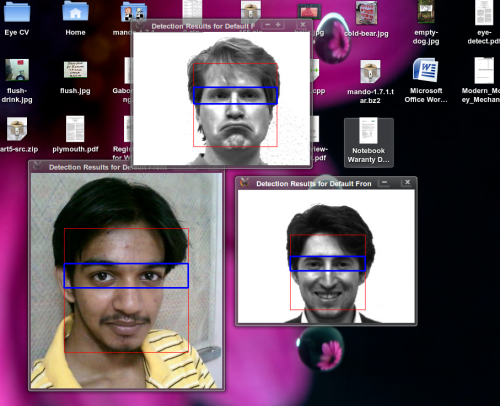 For face detection, I’ve used Haar cascades that are bundled with opencv. I’ve also thrown in a quick and dirty hack to reduce the area to search for eyes – using the now-famous golden ratio – by estimating where the eyes should be ( which has almost always turned out to be correct, by the way ), and then drawing a rectangle over the predicted line. Now, if I wish to implement eigeneyes, I can always just use this rectangle, and not the whole face photo. Ah, by the way, I have used eigenface for recognition – learning this really helps in learning some of the most basic techniques of data mining – like PCA. Future plans include a PAM module for KDM, an automatic photo-tagging application, and a suspect identification system. Here’s facestalker on my github. Too bad there aren’t any hashtags for blogger, I hate putting so many links here!! !